Once the garage door springs are broken, they cannot be fixed. They are not actually repaired but replaced. Springs might break for a number of reasons starting with having completed their life cycle, due to an installation of a heavier door or during a very windy day. In any case, their replacement is necessary or the garage door won't open. 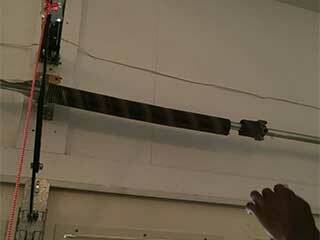 Garage door springs must be measured accurately and with their coils compressed before new ones are ordered. The length of the spring without the end parts, the inside coil diameter and the wire size are all important and must be measured with precision. Depending on the type of spring, one must choose the right end parts. In the case of extension springs, one must to know the type of hook or loop, and in the case of torsion springs one must choose the right stationary and winding cones. Since extension springs come in pairs, when one of them is broken it is wise to replace both to make sure even balance is given to the garage door.